and cover the City from Wigston, were likened to buying a fire extinguisher for your kitchen but keeping it in the attic. The protection should be near to the areas of high risk, our hospitals, universities, sports grounds, high rise flats, listed buildings that don’t have modern fire precautions and so on. Claims that fire engines were able to get from outlying stations to anywhere in the city in 10 minutes were laughed at. It seemed that computer models did not allow for traffic. The scrutiny committee also criticised the figures in the budget, arguing that the level of cuts need were exaggerated. It was confirmed by the Finance Officer that a planning provision rising to £1.2m in 2019 was not a statutory requirement. If this money was instead used to reduce the savings it would produce a £1.2m surplus in 2016, which if carried forward would produce a £0.9m surplus in 2017, leaving a £400,000 overspend in 2018. (then this could be dealt with by another £1.8m in reserves) This approach is the same as the City Mayor has used to balance the Council’s books over the last few years and councillors urged him to apply it to the Fire Authority to avoid these damaging cuts. Councillors also agreed to urge the Fire Authority to consider a referendum to increase the precept, to cover the budget shortfall. One member pointed out that if this was done the increase could be as little as 60p a month. There was strong support for this as. All felt that the public would support such a very small increase rather than put lives at risk as these cuts clearly do. c) the budget assumptions exaggerate the level of savings required. 2) to look at a managed reserves budget strategy which could produce a balanced budget for the next 3 years. During this time plan a referendum, with a county wide campaign, to support and increase in the Fire Precept to meet the longer term budget shortfall. 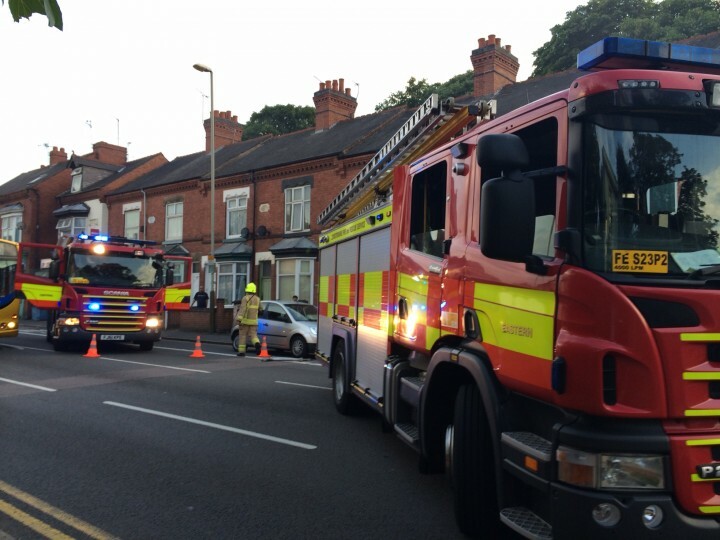 Six fire engines attending a fire last year on Loughborough Rd. Council Members exercising common sense – The Overview Select Committee should be congratulated on showing common sense. They, as are the Fire Service, is there to protect the citizens of Leicestershire. Any major emergency that occurs where life is in danger, the Fire Service responds instantly, with trained personnel that get the job done. The principal officers at the top of the Leicestershire Fire and Rescue Service appear to have been promoted to these posts with the express aim of dismantling and destroying one of the most revered and admired services in Leicestershire, a service where protecting and caring for all life regardless of colour or creed, comes as second nature, where compassion exists hand in hand with bravery, values that make the Fire Service such an admired profession the World over. They will of course move on in the not so far-off future, their names forgotten like those few before them that lost sight of just why they took up the battle against fire and the protection and care of the community they live in. So long as we have Council members with common sense, that understand Public Service is just that, a Service to the Public, then we will have a safe and secure environment we can all live in. From what I can see with this decision from the OSC we in Rutland need this level of common sense from our council leaders instead of giving the appearance of doing the right thing by the public and then going behind our backs with senior staff at the fire service. We as a community proposed to allocate £150,000 from our council tax to save our fire engine and staff in Oakham and Uppingham and it not only fell on deaf ears at Fire HQ, but they have proposed to use that money to fund a ‘Dinky Toy’ trial with our council agreeing to it. The money wasn’t for that, otherwise we wouldn’t have suggested it or agreed to it. We are a growing community with two large military camps, both with increased personal coming from Germany, schools that are on the increase, an additional 1500 homes being built in one area alone, major roads in our area and some dangerous industrial works so common sense say’s that we can’t afford a reduction in our own safety at all but an increase in fire and rescue facilities.